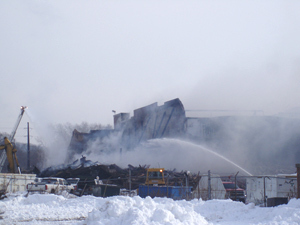 Fire at the former Farmstead plant in Cedar Rapids. A fire at an abandoned meatpacking plant in Cedar Rapids continues to burn and while firefighters say they’re making progress — the smoke from the fire has been a problem. The fire began Tuesday morning at the old Farmstead Foods plant in southeast Iowa which includes several buildings linked together. Demolition crews have been knocking down walls as firefighters pour thousands of gallons of water on the smoldering buildings. The Teddy Bear Child Care Center is about two miles downwind from the burning plant. Center worker Janice Meyers says there’s still a very strong smell just outside the building. She says it smells like burning rubber. Meyers says health officials say the smoke won’t hurt them, but they’re still taking precautions with the kids. “We only stay out for like 20 minutes at a time but they say it’s not toxic and it isn’t going to hurt you, I mean because we’re so far away from it but we still don’t leave them out very long,” Meyers says. Meyers is correct in that there’s no proof toxic chemicals are being released into the air. But there are still health concerns. Jim Hodina is the Air Pollution Control Officer for the Linn County Health Department. He says tests near the plant show the amount of particles in the air is more than twenty-times what the E-P-A recommends people are exposed to over a 24-hour period. “It puts stress on the body, so in response to that your body could trigger an asthmatic event, weaken your immune system, things such as bronchitis and so forth,” Hodina says. Hodina is advising everyone downwind of the fire to stay inside and people with serious health conditions should consider temporarily moving out of the area. So far firefighters have used about two Olympic size swimming pools worth of water to try to put out the fire. Cedar Rapids Fire Department spokesman, Greg Buelow says the water is helping but the fire could linger. He says it’s still got a lot of area inside there that as they start to move and tear down walls that could lead to some flare-ups as a fresh supply of air rekindles the fire. The Farmstead Foods plant has been vacant for years though it was used as storage. The building was flooded last year and 25 semi-trailers worth of corn were left inside.Firefighters say that’s what’s likely fueling the fire. There was a fire on the same property this summer and it smoldered for months.